When decorating interior walls, polyurethane decorative panels offer a wide range of faux finishes, imitating materials such as stone, brick, textile, concrete or wood finishes. Can wood beams be made of polyurethane systems? There is a wide variety of polyurethane systems that allow to mould objects and give them realistic material finishes. We have some examples, such as the integral skin leather finish for office furniture or the imitation of brick or stone in decorative panels. 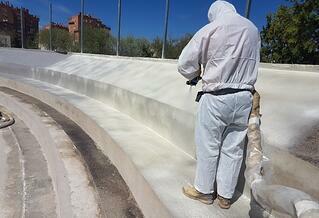 Urespray P-500 is a polyurethane elastomer used to waterproof and protect all types of surfaces. This system has received the European Technical Assessment (ETA Nº 16/0153). Synthesia Technology Europe, S.L.U. (former Synthesia Internacional S.L.U. ), founded in 2008, is dedicated to the manufacture and commercialization of chemical products, polyesters and polyurethane systems for thermal, acoustic and various industrial applications. © Synthesia Technology 2018. All rights reserved.